Week 15 - Brush Pen Sampler Number 2 purchased for $26 with free shipping from jetpens.com. Also, this week, I tried out the 12 color Pentel Touch Sign Pen set from Target, purchased for $19.99 plus tax. There are six pens in the Jet Pens sampler, 5 of them disposable with fibrous tips and one nylon brush type cartridge style refillable pen. The first brush pen I tried was the Kuretake No. 8 Fountain Brush Pen, it is the cartridge style refillable one with nylon bristles. It's very similar to a Pentel Pocket Brush Pen, only the brush tip is a little shorter. I really like this style of brush pen, as it allows me to get very fine lines in flowing strokes that can have varying widths. I used that pen to make "The Cooker" drawing, inspired by the audiobook I'm currently listening to on my work commute, "Maplecroft." 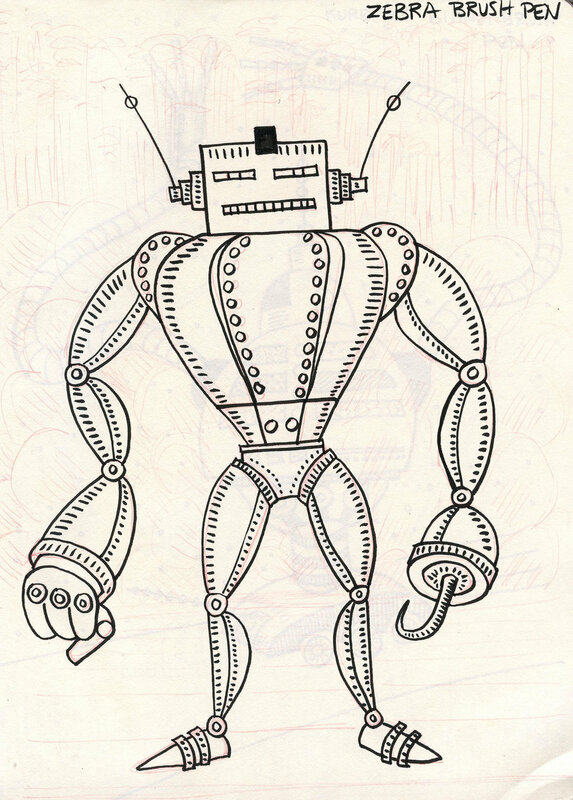 I thought I would make drawings of robots to test out the rest of the pens in the sampler. These pens have firmer tips that do not have bristles, but do allow for varying line widths depending on the firmness of each pen. I made the robot sketches a a large Piccadilly Blank Journal with light cream colored pages. I think these journals are really meant for writing, but I like to make sketches in them. I'm almost finished filling my second journal of 240 pages. The Kuretake Fudegokochi produces a nice dense black line that does allow for slight variations in weight, but I really like the contrast produced on light paper. 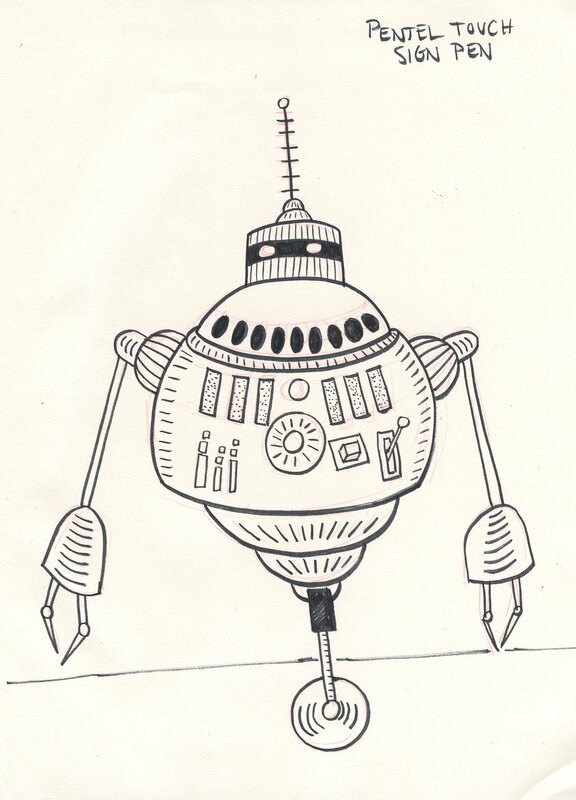 Another of my favorites in the sampler is the Zebra Disposable Brush Pen which produced crisp linework in my robot sketch. The other pens in the sampler are Kuretake Bimoji Brush Pen, Pentel Touch Sign Pen, and Pilot Fude-Makase Color Brush Pen. All the pens aside from the Kuretake No. 8 Fountain Brush Pen, are very similar in performance, so it would be a personal preference as to which one feels best in hand. As mentioned before, the Kuretake No. 8 is refillable and has actual brush bristles. 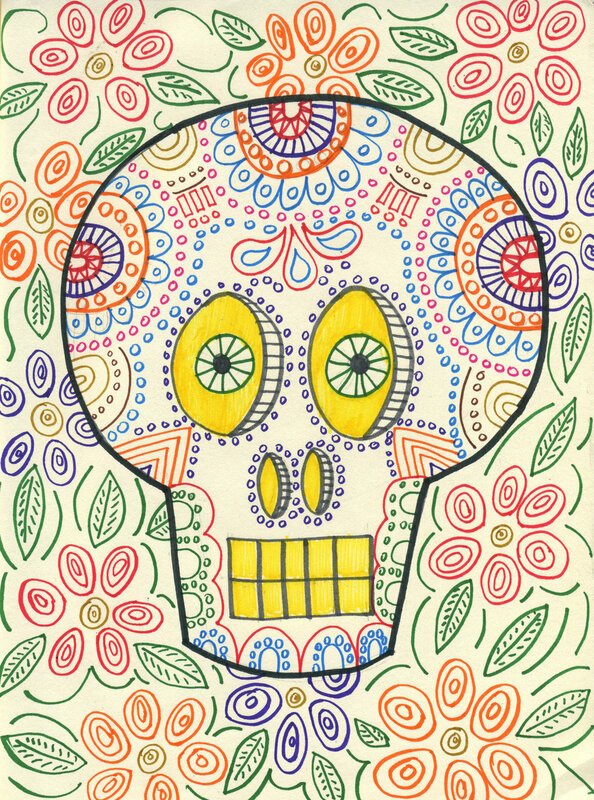 I made a Sugar Skull drawing so I could use all the colors in the 12 color Pentel Touch Sign Pen set that I purchased at Target after hearing about it on the Erasable Podcast. These pens are nice, and of course are just like the Pentel Touch Pen included in the JetPens sampler, only in colors. I think these would probably be good for hand lettering or writing in a journal. Next up in Create-A-Thon 2017 - Winsor and Newton Watercolor Brush Pens.